Finite Solutions invented PC-based casting simulation back in 1985. 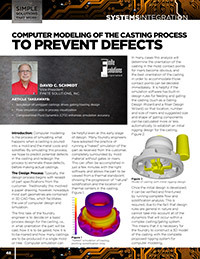 We’ve been applying our experience to continuous improvement of metal casting software ever since. Unlike other developers who come from academic backgrounds, we have actual foundry experience and understand the day-to-day challenges of working in this industry. With more than 27 years of experience and enhancements, the Finite Solutions metal casting simulation software provides amazing accuracy for prediction of most foundry defects in the majority of casting processes. This means that we’ve concentrated on developing the features that make the Finite Solutions metal casting simulation software the practical choice for most foundries in the world. Due to this, and our commitment to excellence, Finite Solutions has become a global standard in casting software. Used in over 800 foundries and universities around the world, we have the largest customer base in the entire industry.